Miltonduff 31 Years Old 1981 – 72.36 Holy moly! Holy moly! 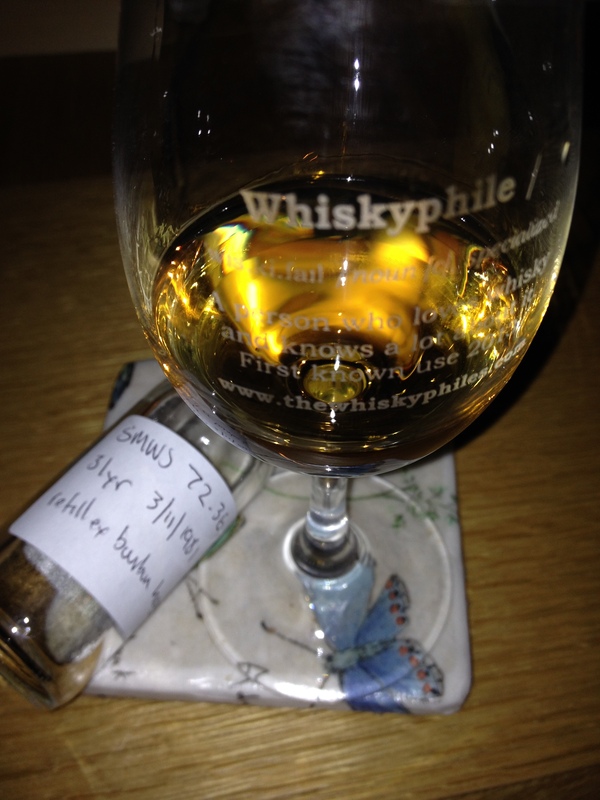 – passion-fruit and kiwi on polished oak – then orange syrup, raspberry tarts, crystallised ginger and toffee, but this was a complex dram and the nose also held sand dunes, railways sleepers, leather armchairs and engine shops. The palate was mouth-watering and friendly – caramel, crème brûlée, tropical fruits, wine gums, red jelly babies and mint humbugs – we knew instinctively it didn’t need water – yet we tried it – and the nose developed pink cup-cakes, icing sugar and marshmallows – very homely. The palate seemed to have absolutely everything – cherry lips, monkey’s blood, Old English spangles, honey-nut cornflakes, pain au chocolat and ash – mmm! Drinking tip: To share with special friends – if you don’t have any handy, line up your teddy bears and have a wee picnic. A beautiful single cask example with plenty of aged oak wood and tempered sweetness of stewed fruits.